There are so many ways to challenge yourself with your workouts. But all too often people only focus on lifting more weight. You can do longer or shorter workouts. You can change up the intensity. You can change up the exercises and the equipment you use. You can vary your rest. You can change up your repetition tempo. You can also vary the VOLUME that you do. And by “volume,” I mean changing up the number of reps and sets you do during your workout. HOWEVER, increasing your workout volume doesn’t have to mean longer workouts. It does, however, mean you won’t be able to lift the heaviest weight you’ve ever used. That being said though, you do want to use a challenging weight that won’t cause you to go to failure, but will create muscle shake-age (that is my very technical term for feeling your muscles start to fatigue as you lift). You want to challenge yourself while allowing yourself to move from one exercise to the next with little to no rest between. And even though you aren’t going to failure or using the heaviest weight you can handle, the sheer volume of work you are doing will create muscle gains. Using heavy weights and low reps isn’t the only way to develop strength and gain lean muscle mass! Higher volume with slighter lighter weights can also cause great gains. For example, the forced reps variations I discussed a few months ago can be a great way to increase your workout volume, challenge yourself and help you progress toward your fitness goals WITHOUT just focusing on always lifting heavier weights or doing lower rep counts. Another great way to increase your workout volume is by doing density sets. One of my favorite ways to do density sets is by setting a timer and then trying to do as many rounds of two or three exercises in that allotted time as possible. During these sets, you will use a lighter weight and stop before reaching failure so that you never really need to rest more than 30 seconds at any time. These density set workouts can also be a great way to get in a little extra “cardio” and can be a great way to give your body a break from the low rep, heavy lifting while still helping you to move forward! And if you’ve plateaued with your low rep, heavy lifting workouts, a high volume workout may be just what you need to get over your plateau. Below is a sample high volume workout to get you going this week! Set a timer for 15 minutes for each circuit. Perform as many rounds of each circuit as you can in that 15 minutes. Rest 2-3 minutes between circuits. Try to rest no more than 30 seconds at one time during each circuit if you rest even that long. Mark down how many rounds of each circuit you get in 15 minutes so next time you have something to compete against and show progress! Single Leg Deadlift – For this move, you can hold dumbbells or kettlebells, but remember DO NOT GO TO FAILURE. Beginners should start with bodyweight. Stand on one foot with the knee of that standing leg slightly bent. Hinge over at your hips, sweeping the other leg back toward the wall behind you. Pretend you are driving the heel of that foot straight into the wall behind you. Lean forward with your upper body as you hinge forward, keeping the back nice and flat. Make sure that as you hinge, you are sitting into the heel of your standing leg. Do not lean forward and come up onto your toes. To stand back up, drive through the heel of your standing leg and squeeze your glute at the top. Try not to tap the other foot down at all or at least not till you are fulling standing. Complete all reps on one side before switching to the other leg. 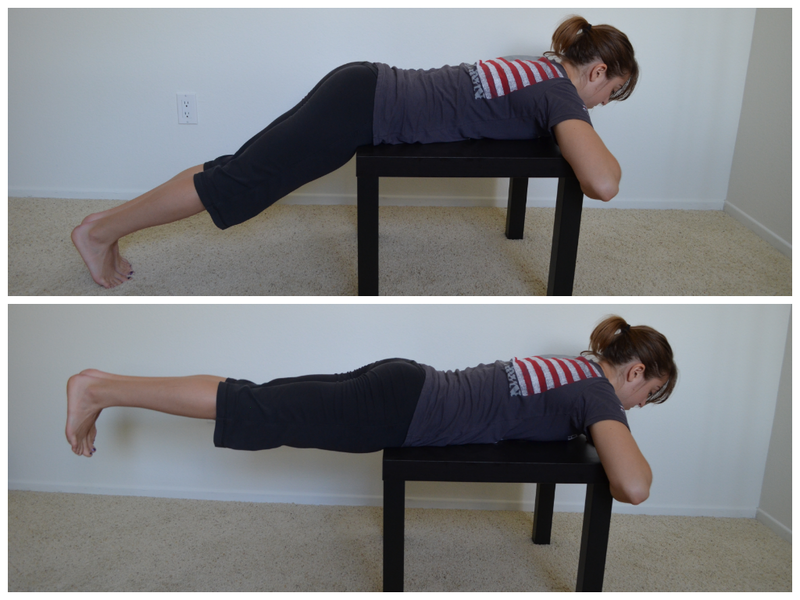 Reverse Hypers – Click here for a description and pictures of me using a small side table I have at my house to do the Reverse Hypers. You can also use a box step or do this move from the ground; however, I do prefer the range of motion the table or box step provides. Backward Rotational Lunge to Front Lunge Across – This move is actually two lunges, which means that 1 rep is actually 2 lunges. On one you rotate back and open and on the other you come forward and across. Start with both feet pointing toward “12” on a clock. Performing the lunge first with the right foot moving, take the right foot and move it back toward “5” on the clock. As you reach your foot back toward “5,” you will pivot that toe so that it is perpendicular to the front foot which is still pointing toward “12.” Lunge down, bending the right knee while keeping the left leg straight. You are sinking your weight back into that right foot. Then drive up off the right heel and come back to standing. Beginners may need to pause in the middle between lunges while more advanced exercisers can go right from the back rotational lunge into the forward cross lunge. After driving the right foot back to center, bring it forward and across the body toward about “10/11” on the clock. Your right foot will again turn so it is perpendicular to your left foot which is pointing toward “12.” Sink down into a lunge, bending both knees and then drive off the right heel to come back to standing. Repeat those two lunges and then switch to the other side. 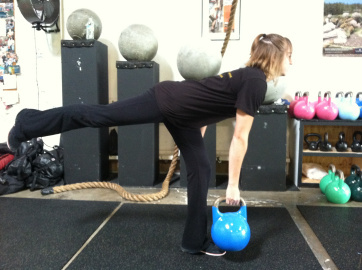 Beginners will want to use bodyweight while more advanced lifter may front load with a kettlebell or dumbbells. In this I show the backward rotational lunge and the front lunge across but without turning the toe. Not turning the toe on the front lunge can reduce the stress on the knee if you are new to these lunges and/or have knee problems. Single Leg Glute Bridge – Beginners will perform a single leg glute bridge from the ground (however, if you can’t get your hips up as high as with the two leg glute bridge, stick with the two leg variation for now). More advanced exercisers may put their foot up on a box or advance the move further by putting your back and your foot up on benches/boxes. Remember though, you can’t go to failure during these density sets. Do you pay attention to the volume of work you are doing? How do you challenge yourself without just adding more weight? NOTE: Not every workout should contain a ton of reps and sets. Do not go overboard with volume and/or intensity. Not every workout has to be the hardest thing you’ve ever done. Varying your volume and intensity is key to getting results while preventing overuse and injury. Workout variables need to be manipulated to help you work toward your goal. Posted on December 2, 2013, in program development, Workout and tagged density sets, glute workout, high volume workouts, higher repetition workouts for muscle and strength gains, workout variables. Bookmark the permalink. Leave a comment.